Quick chats with the famous and not-so-famous who are in town for the DNC. 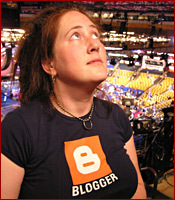 Bloggers are posting notes about politics, parties, and the press. Demonstrators assemble on Boston Common and march to the FleetCenter.